A wonderfully exuberant and brilliantly acted family-inspired narrative by a Seattle-based playwright and actor. These are actually two different shows, each of which is a couple of hours long, presented at different performance times. Properly, one should see Dragon Lady first, but I caught Dragon Mama, the sequel, at its world premiere performance beforehand. It didn’t matter. It was so exuberantly brilliant in conception and execution that it drove me back the following week to see the more honed and fully produced antecedent, Dragon Lady. Together, they make quite a pair, and there is another one coming to finish out the so-called Dragon Cycle. Sara Porkalob is a Filipino-American playwright, actress, and performance artist based in Seattle. She is only in her late twenties, which makes the power and compelling drive of her performance particularly remarkable. In short, the stories that fill both shows come from the past two generations of her family. Dragon Lady dominantly focuses on her grandmother, while Dragon Mama focuses on her mother. But both shows have lots of stories from overlapping times, so there is no clear absolute boundary of subject-matter dividing them. In fact, Porkalob’s technique is to jump around so much from time-frame to time-frame, and from situation to situation, that were she a lesser actress, one might never find continuity in the story line. But she is a superb and convincing actress, and so amazingly good and holding the twenty or more characters she embodies in each piece, that one has no significant trouble following the tales. In Dragon Lady, the original and more fully developed show in some sense, has a few props and a band. From time to time, Porkalob breaks into song, and boy can she sing. She is as great a singer as she is an actress, and that is saying a lot. Her voice is rich and powerful and at times sweetly lyrical. And her work with the band has been honed so that the numbers come off convincingly. None of the tales Porkalob tells is pleasant or easy. 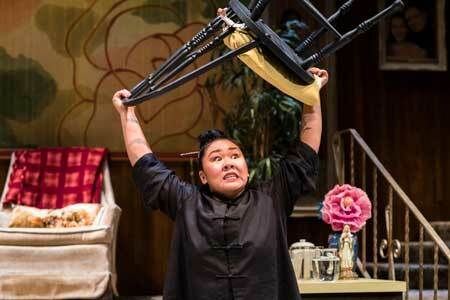 She creates the role of her accented Filipino grandmother with such vicious intensity that it is at once heartbreaking and hilarious. Porkalob pulls no punches, never sweetens the sauce, and comes out of the gate with hysterically intense and unexpected lines and ones that draw vivid characters in broad, colorful strokes. After watching the bulk of Dragon Lady, one could never, in fact, imagine meeting this wild, unpredictable, and in many ways, irresponsible, grandmother, and yet in very direct and palpable ways Porkalob makes that entirely possible. When one gets that sense of immediacy and presence and of the intensity of history that lies behind the relationship, one is both touched and awestruck. Dragon Mama, which had its world premiere last week (and which I had the pleasure to attend) is remarkably developed for a new show. It doesn’t have all the bells and whistles that Dragon Lady does, but it’s vivid, penetrating and equally affecting. Its dominant subject is Sara’s mother, particularly as a young mother in the space of several years after Sara’s birth. Stories about her are astonishing and heart-rending and Porkalob delivers them directly and mercilessly. 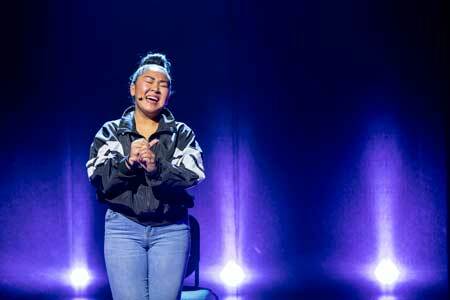 It’s a remarkable challenge for a solo performer to carry a pair of two-hour shows in this way and Porkalob demonstrates, overall, that she is not only up to the task but revels in it. At a few points some of the energy in the performance of Dragon Lady I attended appeared to flag a bit, but never consistently nor for too long. In the end, the power was palpable and the denouement touching, persuasive and forceful. I’m not sure how much Porkalob has been performing Dragon Lady in Seattle and elsewhere, but when I felt a little of that flagging of energy in Dragon Lady I thought of what happened with performance artist Hershey Felder who had a show about George Gershwin that he had to retire for an unspecified amount of time because he had performed it so many times over so many years. That cautionary heads up about a talented performance artist committed to doing the same show again and again surfaced because of a small sense of the personal demand of such a show, though Porkalob is now certainly on top of her game and nowhere near exhausting her energy or material. The sheer exuberance of the very new Dragon Mama was vivid throughout and it may be the freshness of that show that helped propel it notably to that level. The American Repertory Theater has signed Porkalob onto future projects and it will be fascinating to see how their partnership evolves. Clearly this is a remarkably talented writer and performer whose further projects, whether autobiographical or otherwise, should well demand our energetic interest and attention.